Born in the mountains of West Virginia, Dara was privileged to have a large extended family and spent her summers on their farms running free and enjoying the beautiful countryside as well as animals both domestic and wild. Her parents loved to travel and as a result, Dara got to visit over 30 states before entering middle school. Those experiences and sights fueled her desire to become an artist. "I wanted to paint everything; mountains, deserts, forest and oceans" she says. "At the age of five, I moved my bed away from the wall and "painted" a mural the entire length of my bedroom using crayons," recalls Dara. "My mother however didn't agree it was beautiful so I had to scrub it all off., and I cried the entire time, thinking that I was destroying a masterpiece. But then and there, I decided that I would become an artist and no one would want to destroy my work again." From that day on she drew on anything she could get her hands on, while asking her parents constantly for paints and brushes. At the age of 10, they bought her a John Gnagy "Learn to Draw" kit and she got busy! "My teachers usually laughed at the artwork all around the edges of my homework until I got into middle school, where they suggested I take art classes instead. I jumped at the opportunity and never looked back." At the age of 12, Dara's family moved to Kentucky. When the new teachers recognized her devotion to art, they immediately put her into art classes. Always drawing and painting kept her happy, and she was singled out for special tutoring and an art camp, winning awards often. In the 10th grade, that training helped her earn her first Art Award outside of school. "I was encouraged to enter the Bourbon County Art Show where I took first place with "Granny" a drawing of my maternal grandmother. She still hangs on the wall in my home today." By this time, Dara was selling her paintings to teachers, family, and friends. The family continued to travel throughout the country, Canada and Mexico where all the beautiful sights and the wonderful people moved Dara to focus on landscapes; "the colors, shapes and atmosphere of our earth were just begging to be painted, the variety was endless!" Lacking the means to go to art school after graduation, Dara became largely self-taught but, eventually, was able to study under professional artists while attending as many workshops as she could. When she married the "love of her life" and began raising their four children, Dara painted murals professionally for offices, homes and schools in both Texas and Kentucky where they lived. When they became "empty nesters" she returned to canvas work. "My work has always been strongly influenced by the Hudson River school of artists. I loved the realistic, yet romantic quality of their paintings and wanted to be like them, but using more color." In 1989, they moved to Florida with her husband's work. The sun, sand and ocean were so beautiful that she was moved to start looking for ways to depict it using a different style of painting. "My inspiration became our earth's oceans; depicting the movement, emotions and moods of the water while aiming to bring attention to the life and beauty of the oceans and the need to keep them clean and healthy." "Finally, I discovered the new method I was searching for so now, using fluid acrylics, mixed media really, pouring and pushing the paint on the canvas to depict the movement, and then torching to bring out the hidden personality, I create semi-abstract paintings of the ocean, using beautiful blues and greens plus metallic. I call them "Ocean Meditations." This work is at once exciting, maddening, calming, and yet exhilarating and I'm happy to say they have become very popular. I often hear comments such as 'I can feel my toes getting wet just looking at them', 'I can almost feel the ocean spray', and 'I want to dive right in!' "
When her husband retired, they built a small home with a studio for her art. "Now, I paint pretty much full time and we travel far and wide. 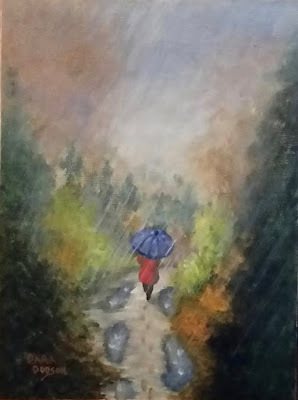 I also teach acrylic painting regularly, sharing with others the skill of painting as it was shared with me." 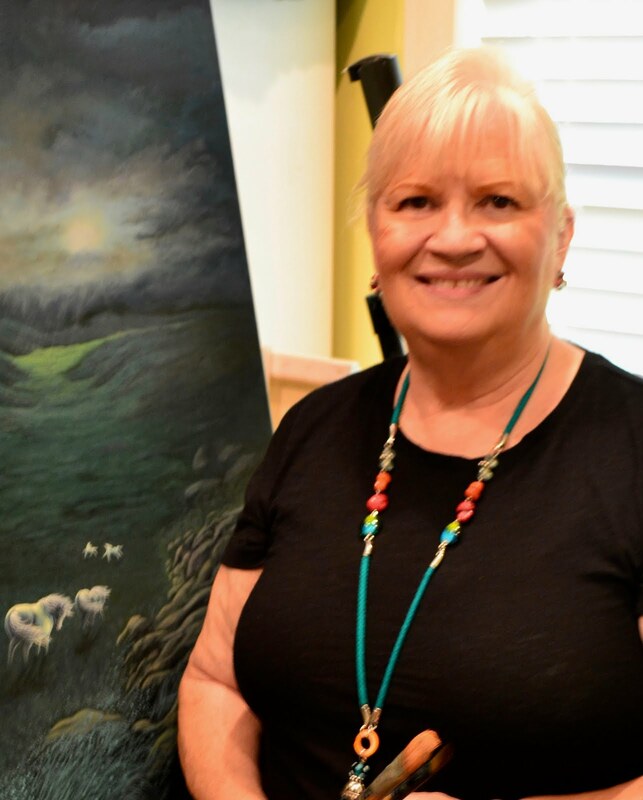 Dara's studio is located in St Augustine, FL, the oldest city in the country, where the "old world" feel, the ocean, the history and beauty have drawn many artists to reside. 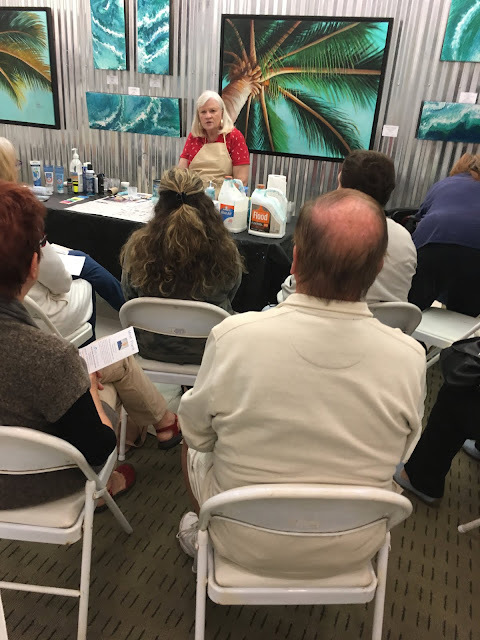 A member of the National Oil and Acrylic Painters Society, the International Society of Acrylic Painters, and Acrylic Painters, USA, Dara shows her art regularly at both the St Augustine Art Association and the St Augustine Beach Art Studio and Gallery, and several other locations. She is represented by OCEAN ART GALLERY in Ormond Beach, Fl and REMBRANTZ GALLERY in St Augustine, FL Her work hangs in homes and businesses across the nation.